Founded in the 1920s, North York has been a growing and thriving district for nearly a hundred years. Today, this diverse area is an important commercial center with many major employers and a steadily increasing population and workforce. As part of Vaughan, North York experiences much of the same harsh winter and road conditions including ice, snow and salt build up on cars. Not only does this make your car look worse, salt can be especially corrosive, causing long term damage when not properly cleaned. Fortunately, with Car Detailing Shop’s expert car detailing in North York, you can avoid this, and many other problems associated with dirt and debris. Book your appointment with Car Detailing Shop by calling 647-920-5199 today! Your car is likely one of your biggest investments and a major part of what helps you get to work, travel and leisure activities. Car Detailing Shop understands how important it is to protect this investment and we make it easier than ever to get North York car detailing with our 100% mobile service. 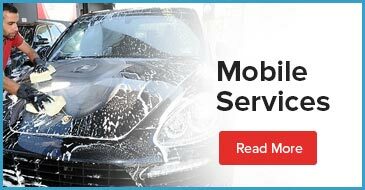 With our mobile service, you get the ultimate in convenient car detailing. By simply providing your address and choosing your preferred time, we’ll bring our mobile service right to your door! Our mobile units come complete with water and power, so we can provide North York car detailing anywhere that is best for you. We also offer a range of affordable package deals for interior and exterior car detailing. North York customers can choose from simple interior shampoo packages all the way up to our like-new car detailing which restores your car inside and out to showroom quality. Learn more about our convenient scheduling and affordable packages by Calling Car Detailing Shop at 647-920-5199. At Car Detailing Shop, we’re dedicated to the health of our environment, our customers and their vehicles. To ensure this we use only the most environmentally friendly methods and products including water-saving steam cleaning for interiors. The naturally antibacterial properties of steam get your interior clean without harsh chemicals that can disrupt the environment and pollute the air in your vehicle. At Car Detailing Shop, we ensure our car detailing in North York meets our rigorously high standards and provides 100% satisfaction. To learn more about why we have over 100 5-star reviews, book your North York car detailing today!